Globally January 2018 was the fifth warmest January since reliable measurements began in 1880, 0.78°C warmer than the 1951-1980 mean. January temperature was +1.05°C relative to the 1880-1920 base period that provides our best estimate of pre-industrial global temperature. January temperatures relative to 1951-1980 mean, in order from the warmest, were +1.16°C (2016), +0.97°C (2017), +0.95°C (2007) and +0.81°C (2015). (http://www.columbia.edu/~jeh1/mailings/2018/20180118_Temperature2017.pdf). Some ocean models are projecting a possible El Nino in the latter part of 2018, which would tend to reverse the recent short-term cooling trend. The geographical distributions of January temperature for the past four years are shown below. Abstract. Global surface temperature in 2017 was the second highest in the period of instrumental measurements in the Goddard Institute for Space Studies (GISS) analysis. Relative to average temperature for 1880-1920, which we take as an appropriate estimate of “pre-industrial” temperature, 2017 was +1.17°C (~2.1°F) warmer than in the 1880-1920 base period. The high 2017 temperature, unlike the record 2016 temperature, was obtained without any boost from tropical El Niño warming. 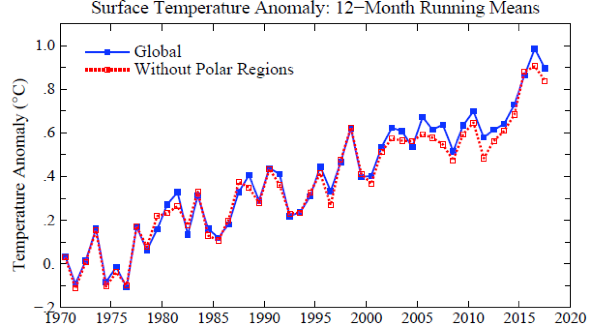 Update of the GISS (Goddard Institute for Space Studies) global temperature analysis (GISTEMP),(Fig. 1), finds 2017 to be the second warmest year in the instrumental record. (More detail is available at http://data.giss.nasa.gov/gistemp/ and http://www.columbia.edu/~mhs119/Temperature; figures here are available from Makiko Sato on the latter web site.) A few figures are included below as an appendix. We take 1880-1920 as baseline, i.e., as the zero-point for temperature anomalies, because it is the earliest period with substantial global coverage of instrumental measurements and because it also has a global mean temperature that should approximate “preindustrial” temperature. We estimate current underlying temperature, excluding short-term variability via linear fit to the post-1970 temperature (Fig. 1). The result is +1.07°C at the beginning of 2018 relative to 1880-1920. Fig. 1. (a) Global surface temperatures relative to 1880-1920 based on GISTEMP data, which employs GHCN.v3 for meteorological stations, NOAA ERSST.v5 for sea surface temperature, and Antarctic research station data. Fig. 2. Temperature anomalies in 2017, 2016 and 2015 relative to 1951-1980 base period. The lower right map shows the difference between the 2017 and 2015 maps. We use the 1951-1980 base period for maps because of more limited global data coverage in 1880-1920. 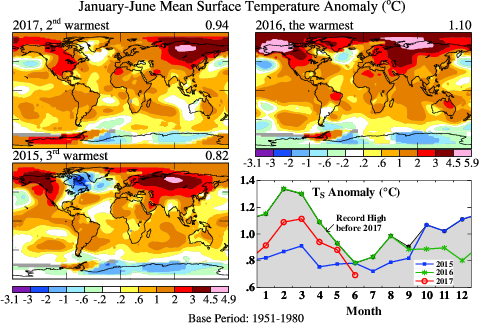 Figure 3 compares the GISS analysis of global temperature change with the case in which the polar regions, specifically regions poleward of 64 degrees latitude, are excluded from the analysis. With polar regions excluded, 2017 becomes the third warmest year, and the ‘global’ warming relative to the base period is reduced by almost a tenth of a degree Celsius. We do not mean to imply that other analyses entirely exclude polar regions. Therefore we make a more specific test of the impact of omitted regions by carrying out the GISS analysis with local measurements extrapolated only 250 km rather than 1200 km. Fig. A2 shows that this area limit also causes 2017 to be only the third warmest year. We conclude that 2017 probably was the second warmest year. However, the temperatures of 2015 and 2017 are so close that the difference is unimportant. Fig. 3. Global temperature compared with the result for integration over the region from 64°N to 64°S, which covers 90% of Earth’s surface, excluding only polar regions. Fig. 4. Solar irradiance and sunspot number in the era of satellite data. Left scale is the energy passing through an area perpendicular to Sun-Earth line. Averaged over Earth’s surface the absorbed solar energy is ~240 W/m2, so the full amplitude of the measured solar variability is ~0.25 W/m2. imbalance, which has grown to about +0.75 ± 0.25 W/m2 over the past several decades due to increasing atmospheric greenhouse gases., However, the solar variability is not negligible in comparison with the energy imbalance that drives global temperature change. Therefore, because of the combination of the strong 2016 El Niño and the phase of the solar cycle, it is plausible, if not likely, that the next 10 years of global temperature change will leave an impression of a ‘global warming hiatus’. On the other hand, the 2017 global temperature remains stubbornly high, well above the trend line (Fig. 1), despite cooler than average temperature in the tropical Pacific Niño 3.4 region (Fig. 5), which usually provides an indication of the tropical Pacific effect on global temperature. Conceivably this continued temperature excursion above the trend line is not a statistical fluke, but rather is associated with climate forcings and/or feedbacks. The growth rate of greenhouse gas climate forcing has accelerated in the past decade. There is also concern that polar climate feedbacks may accelerate. Therefore, temperature change during even the next few years is of interest, to determine whether a significant excursion above the trend line is underway. Fig. 5. Niño 3.4 and global temperature change during the past five years. Fig. A1. Global surface temperature relative to 1880-1920 based on GISTEMP data. (a) Annual and 5-year means since 1880, (b) 12- and 132-month running means since 1970. Blue squares in (b) are calendar year (Jan-Dec) means used to construct (a). Update of Fig. 2 in reference 3. Fig. A2. Global surface temperature with extrapolation of data limited to 250 km from observations. Fig. A3. Global temperature in the past 100 and past 50 years based on local linear trends. The current GISS analysis employs NOAA ERSST.v5 for sea surface temperature, GHCN.v.3.3.0 for meteorological stations, and Antarctic research station data, as described in reference 1. Hansen, J., M. Sato, P. Kharecha, K. von Schuckmann, D.J. Beerling, J. Cao, S. Marcott, V. Masson-Delmotte, M.J. Prather, E.J. Rohling, J. Shakun, P. Smith, A. Lacis, G. Russell, and R. Ruedy, 2017: Young people's burden: Requirement of negative CO2 emissions. Earth Syst. Dynam., 8, 577-616, doi:10.5194/esd-8-577-2017. Hansen, J.E., and S. Lebedeff, 1987: Global trends of measured surface air temperature. J. Geophys. Res., 92, 13345-13372, doi:10.1029/JD092iD11p13345. von Schuckmann, K., M.D. Palmer, K.E. Trenberth, A. Cazenave, D. Chambers, N. Champollion, J. Hansen, S.A. Josey, N. Loeb, P.-P. Mathieu, B. Meyssignac, M. Wild, 2016: An imperative to monitor Earth's energy imbalance Nature Climate Change 6, 138-144, doi:10.1038/nclimate2876. Hansen, J., M. Sato, P. Kharecha, and K. von Schuckmann, 2011: Earth's energy imbalance and implications. Atmos. Chem. Phys., 11, 13421-13449, doi:10.5194/acp-11-13421-2011. Globally November 2017 was the third warmest November since reliable measurements began in 1880, 0.87°C warmer than the 1951-1980 mean. November temperature was +1.15°C relative to the 1880-1920 base period that provides our best estimate of pre-industrial global temperature. The strong 2015-2016 El Nino ended about a year and half ago and the tropical Pacific is now in a La Nina phase (temperature anomaly less than -0.5°C; see left side of above figure). However, global temperature remains high, which will make 2017 the 2nd warmest year globally. 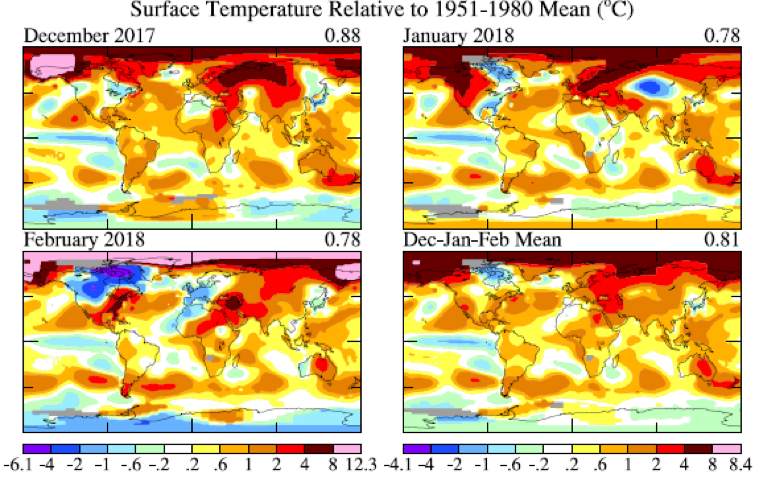 The geographical distribution of annual temperature anomalies for the past three years is shown in the figure below (January-November mean for 2017). Globally October 2017 was the second warmest October since reliable measurements began in 1880, 0.90C warmer than the 1951-1980 mean. October temperature was +1.18C relative to the 1880-1920 base period, which provides our best estimate of pre-industrial global temperature. The warmest October was 2015 at +1.08C relative to the 1951-1980 mean. 2016 was the 3rd warmest at +0.89C. The 2017 January to October 10-month mean is second highest, behind 2016, compared to the first 10 months of other years. Although a weak La Nina is present, the global mean temperature in October stayed relatively high; polar regions were especially warm. 2017 will likely to be the second warmest year in the record. Globally September 2017 was the fourth warmest September since reliable measurements began in 1880, 0.80C warmer than the 1951-1980 mean. Warmest Septembers were 2014 and 2016 at +0.87C, with 2015 third at 0.82C. The 2017 January to September 9-month mean is second highest, behind 2016, compared to the first nine months of other years, as shown above. If the temperature anomaly for the next three months (relative to the 1951-1980 mean) is less than 0.75C (i.e., if October-December 2017 is more than 0.33C cooler than October-December 2015) the annual 2017 temperature would fall below that of 2015, making 2017 the third warmest year. Even though a La Nina may be in the offing for this fall-winter, a cooling that large seems unlikely, so 2017 will probably be the second warmest year. Compared to the 1880-1920 mean (which is also our best estimate for the pre-industrial average temperature) global temperature is now about +1.2C (see figure below). The warming rate since 1970 is 0.17C/decade. Globally July 2017 was the warmest July (+0.83C relative to the 1951-1980 mean) in the record, with July 2016 second at +0.82C. See figure below. For the half year January-June, 2017 is the second warmest, about halfway between the warmest (2016) and the 3rd warmest (2015). Global temperature dropped sharply between May and June this year, as shown by the red curve in the lower right part of the first chart. That sharp drop is also apparent in the line graph in the second chart, where, for the first time since 2014, the monthly temperature anomaly dropped well below the trend line. The map for the June 2017 temperature anomaly (right side of the second chart) reveals that the sharp drop in global temperature was due substantially to an unusually cold Antarctica*. Antarctic temperature in winter months has very large natural variability, so there is no reason to expect that cold anomaly in Antarctica to continue. However, returning to the line graphs in the lower right of Chart 1, we note that it is unlikely that the second half of 2017 can match the warmth of the second half of 2015. The second half of 2015 was affected by a building strong El Nino. In contrast projection, NOAA projections for the second half of 2017 (chart 25 of http://www.cpc.ncep.noaa.gov/products/analysis_monitoring/lanina/enso_evolution-status-fcsts-web.pdf) have declining SSTs in the tropical Pacific. So it is possible that the 2017 annual mean temperature may fall closer to the 2015 annual mean. *Note that the rectangular latitude-longitude projection of our maps exaggerates the size of polar anomalies. Other projections can reduce or remove area bias. We prefer the rectangular projection because it allows more accurate location of features. Compressing polar regions in alternative projections produces lots of blank area on the page and loses spatial resolution in the polar region. May 2017, at +0.88C relative to the 1951-1980 mean, was the second warmest Mayin the period of instrumental data, only 0.05C cooler than May 2016 record high (0.93C). ENSO (El Nino-Southern Oscillation) in the tropical Pacific are now near neutral, while the first half of 2016 was affected by the strong 2015-2016 El Nino. Given present and projected ENSO conditions (neutral or slightly positive) it can be projected that 2017 as a whole is likely to be the second warmest year in the instrumental record, not much cooler than 2016. Note: our “Young People’s Burden” paper has been accepted for publication in Earth System Dynamics. We thank the editor and reviewers for assistance in producing a much improved version of the paper, which we will make available with discussion on www.columbia.edu/~jeh1 as soon as it is published (within a few weeks).